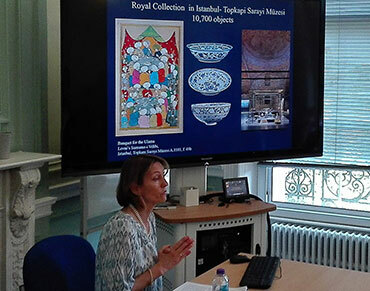 “Blue and White Ceramics in the Middle East: Exchanges with China”, the seventh lecture in the 2017/18 MBI Al Jaber Lecture Series, was delivered by Dr Melanie Gibson, Executive Trustee of the Gingko Library and Senior Editor of the Gingko Library Art Series. Her talk was preceded by an introduction to the activities carried out by Gingko, a charity that strives to bring together artists and scholars from both the East and the West. The introduction was given by Dr Barbara Schwepcke, CEO and Founder of Gingko. Dr Gibson started out by comparing how the trend of collecting pottery, especially blue and white pottery, was very new to 17th and 18th century Europe but not quite so to the Middle East. In fact, she pointed out how the foremost collections of this kind are those preserved in the Topkapi Palace of Istanbul and the National Museum of Tehran. These items have joined the collections in all sorts of ways; for instance, they might have been diplomatic gifts, purchases or even confiscations from former members of the elite and, very rarely, they belonged to one single ruler. The combination of colours mentioned above, blue and white, has widely been used throughout the Middle East and western Asia for a very long time; it is a tradition that goes back centuries, starting in Ancient Egypt. Dr Gibson pinpointed how this constant and ever-present combination of colours is strictly connected to the idea of water, which would resonate mostly with those in arid areas of the world. In fact, even during the Abbasid period, in which local potters started manufacturing their own items, they kept matching blue with white, while trying to characterise their artefacts by inventing new designs which mimicked local wildlife and flora. Chinese pottery, though, was still highly regarded and Melanie explained how massive the amount of ceramics imported from China was by reporting on the discovery of a shipwreck found by the Indonesian coast. The motifs and images that appear on blue and white ceramics stored in the ship tell us that it was likely to have been a commission by the caliph in Baghdad. This is due the fact that these motifs belong to a tradition born at the very heart of the Abbasid Caliphate: Iraq. The second part of Melanie’s lecture touched on how the many traditions of Chinese pottery came to travel from their original geographic area to western Asia, all the way to Damascus, owing to the Mongol invasion and the expansion of Timur’s empire. This brought about a tendency to imitate Chinese pottery, which resulted in slight stylistic shifts in the decoration of ceramics. Nevertheless, these shifts can still be considered a new style in their own right; a style that was employed by several craftsmen and entered the palaces of local noblemen. The MBI Al Jaber Seminar Room was filled to capacity and during the Q&A session, the audience raised many questions demonstrating their fascination with the topic. The final presentation of the MBI Al Jaber Lecture Series will be on Thursday, 21st June 2018. “Palaces and Water in the Early Alhambra” will be delivered by Dr Anna McSweeney, lecturer in art history at the University of Sussex. For more details, please go to our Forthcoming Events page.